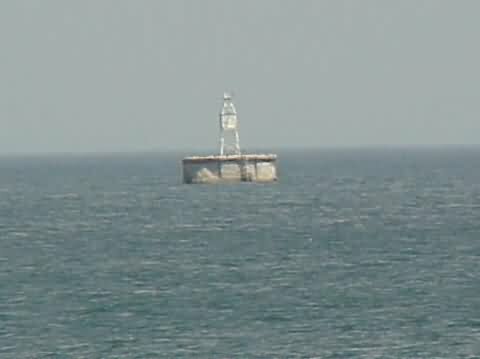 Racine Reef Lighthouse protected vessels from certain death as it warned them of dangerous obstacles two miles offshore from Racine. The uniquely styled building with its tower jutting from a four point roof lost its battle to the elements and then its life to the Coast Guard. In 1961 the 55 year old lighthouse was demolished. While the wrecking work was underway, the sections of a prefabricated skeletal tower to be assembled on the crib was delivered at the Racine Coast Guard station. With the final remnants of the once majestic station stripped from the crib, the new white skeletal tower was loaded on the barge, towed out to the reef and erected on the naked crib, where it stands to this day. From I-94 take exit 333 and head east on Route 20. Stay on Route 20 for 8.6 miles until you come to Route 32. Continue straight Route 32. Route 32 goes into downtown Racine, and turns left to join with Main St. When you get on Route 32, in 1.1 miles you will turn right onto 4th St. Follow 4th to the end where you'll enter Racine Harbor Park. At the far end of the park is the red North Breakwater light and the less attractive, but functional, south breakwater light. 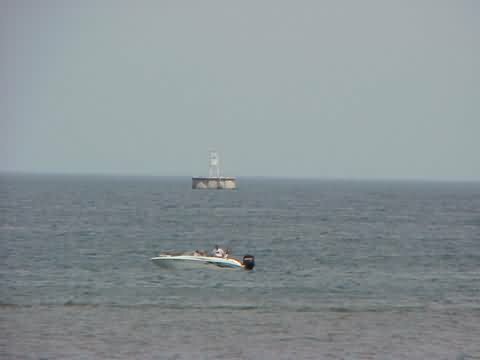 Abot 1/2 mile offshore you can see the Racine Reef Light.